Dr Merle Patchett is a cultural geographer and freelance curator. 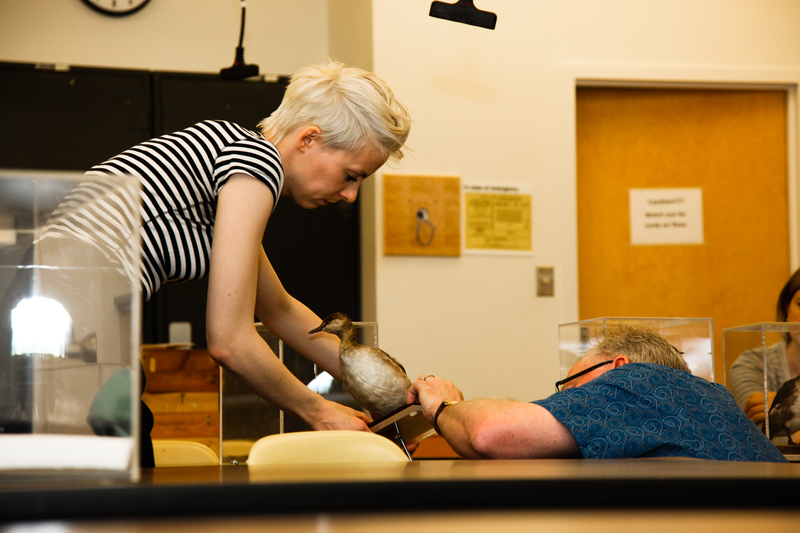 Her past five years of research were dedicated to the exploration of human and animal lives connected through the cultural practice of taxidermy, and wholly funded by the Arts and Humanities Research Council. For example, her PhD project – Putting Animals on Display: Geographies of Taxidermy Practice – critically examined the craft worlds and knowledge-practices of taxidermists, past and present, and their material culture of animal remains. Part of the goal of this research was to reassert the value of taxidermy specimens and collections through collaborative exchange with museum practitioners and contemporary artists. 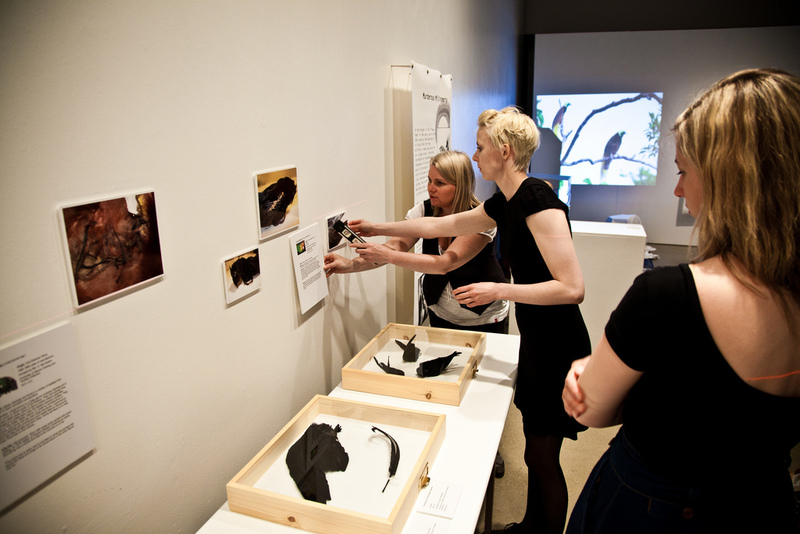 The collaboratively curated exhibitions Blue Antelope (2006) and Out of Time (2007) were the practical outcomes of different investigations by geographers and artists into how interest in zoological collections can be reactivated (see Patchett 2007; Patchett 2010; Patchett and Foster 2008; Patchett, Foster and Lorimer 2011). 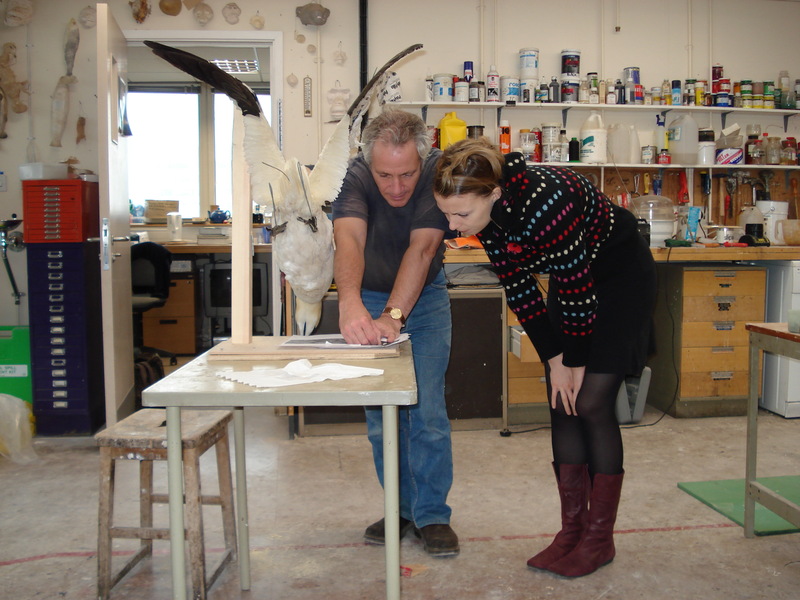 Merle (left) preparing a Horned Grebe that modelled work from Kate Foster’s BIOGRAPHY OF A LIE collection. Merle Patchett currently a Lecturer in Human Geography in the School of Geographical Sciences, University of Bristol. Fashioning Feathers… arises out of postdoctoral research carried out by Merle when a Post Doctoral Fellow at the University of Alberta and pre-existing collaborative curatorial relationships and creative work between her and the artists Kate Foster and Andrea Roe. To apply this work to a Western Canadian context and Clothing and Textiles Collection new collaborative working relationships were sought and developed between Patchett and Dr Liz Gomez (who has expertise in Western Canadian cultural history) and staff at the University of Alberta’s Material Culture Institute and Clothing and Textiles Collection. Liz overseeing the placement of specimen labels. Kate Foster’s artwork looks at how animal and human lives are entwined, in an era of species loss and environmental change. The work included in Fashioning Feathers (‘THE BIOGRAPHY OF A LIE’) was the forerunner of a series of ‘Biogeographies‘. 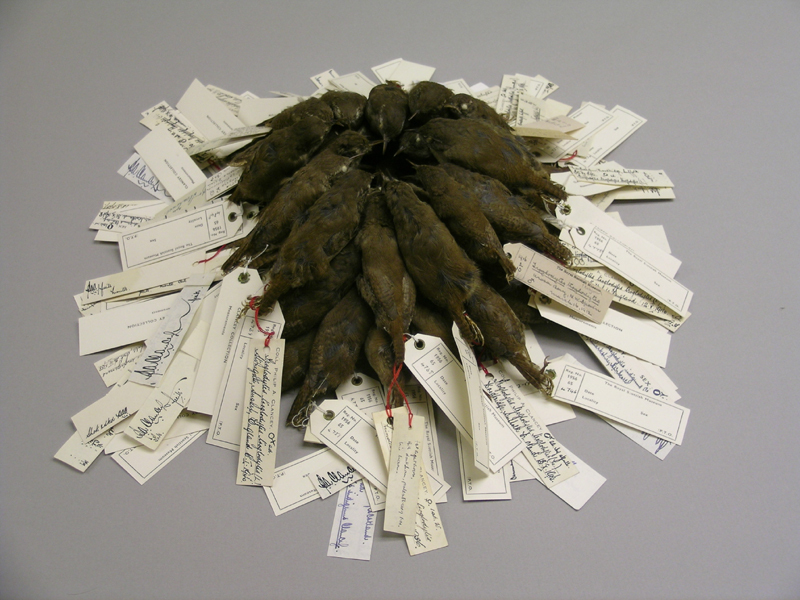 Supported by residencies in Glasgow University (2005) and Stellenbosch University, South Africa (2007) , this project has generated unique histories of zoological specimens – becoming collaborative works extending ‘animal afterlives’ in human settings, which reflect obliquely on how natural history presents its subjects and the contemporary value of these collections. For example, working with geographers and museum staff, she drew attention to a rare and overlooked skull of an extinct South African antelope in the Hunterian Zoology collection. This led to traverses in time and place, holding hope of generative possibilities within a degrading legacy of loss and humiliation (‘Blue Antelope’). Complementing such archival projects, current work is directed at ‘drawing in the field’ in a rural area of Scotland – creative investigations of land-use, developing sensitivity to ‘changeable places’ and choices that are being made. As an environmental artist, her use of media is flexible and responds to context – documenting interventions and investigations through drawing, photography and writing, made available online. Overall, her work is informed by empirical study but the priority is making visual artwork to engage undisciplined senses (complex and surprising), offering routes to engage with ecological interconnectedness. 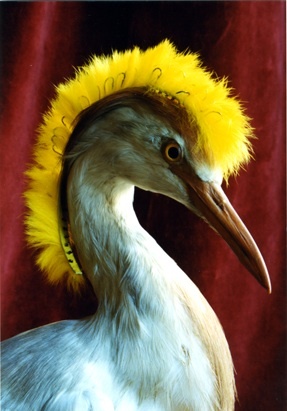 BIOGRAPHY OF A LIE: Egret/Chapeaux © Kate Foster. Andrea Roe’s work examines the nature of human and animal biology, behaviour, communication and interaction within specific ecological contexts. Several residencies have introduced her to very different types of institutions (ranging from the Wellcome Trust to the Crichton Royal Psychiatric Hospital, and the Natural Science Department of National Museums of Scotland) where she has learned about and responded to research projects and collections. Through the media of photography, film, and installed sculpture, Andrea translates scientific research on the physiology of animal behaviour into installations that viewers experience physically as unfamiliar, visceral sensory encounters. Her aim through works like Cat Whisker Corridor, Blackbird Menagerie, Paddling Gull and Kingfisher is to make research discoveries accessible and exciting to those outside the scientific world. 60 Wrens © Andrea Roe. 60 Wrens was inspired by looking into the museum drawers at the National Museums of Scotland and references the roosting behaviour of wrens in the wild.